H. G. Wells published his first novel, The Time Machine, in 1895, just a few years before Queen Victoria's six-decade reign over the U.K. ended. An even more durable dynasty was also drawing to a close: the 200-year-old Newtonian era of physics. In 1905 Albert Einstein published his special theory of relativity, which upset Isaac Newton's applecart and, to Wells's presumed delight, allowed something that had been impossible under Newton's laws: time travel into the future. In Newton's universe, time was steady everywhere and everywhen; it never sped up or slowed down. 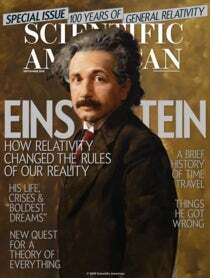 But for Einstein, time was relative.